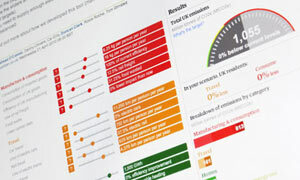 From the Guardian.co.uk we get a “National Carbon Calculator” so your average “Joe” can play around and see what the effects of changing things such as rail travel, low-carbon diets, electricity consumption and others will have on CO2 levels. If they really are serious, they should have factored in money. Like if they change their rail to all-electric, how many billions will it cost the taxpayers? They should also add in a part that shows how much your taxes will go up, and how fast it will bankrupt Britain, which from what I’ve reading may not be too far away. Get Yer Free Dimbulbs, Only £45 Each!!! More CO2 inspired insanity from the UK, they must really love The Goracle over there is all I can say. Per this article in Telegraph.co.uk we have what I’d go so far as to term super insanity. More than 200 million free energy-saving light bulbs have been sent to households over the last two years by energy suppliers. The mass mail-out was caused by gas and electricity suppliers trying to hit Government targets to reduce carbon emissions. Yes that’s right 200 million of them! Just look at how CO2 Insanity can cost you money! However, Which?, the consumer watchdog has calculated that each household has ended paying £45 each through higher energy bills to fund the scheme, even though many consumers objected to being sent the bulbs. Many complained about having to go to the Post Office to collect what they thought was a parcel, only to find it was a bulb that did not even fit any of their lamps. Nice planning, sending out bulbs that don’t fit. Must fall into the category of dimbulbs. It appears it’s more important to hit the target of carbon reduction than to actually have any common sense, much less use it. Companies had various options of how they hit their targets to reduce carbon emissions, but if they failed to hit their targets they could be fined 10 per cent of their turnover. The companies were, crucially, allowed to pass on the costs of the scheme to customers. Hmmm…so what gets passed on to consumers anyway? Ofgem, the industry regulator, calculated that £84 out of the average dual fuel bill of about £1,200 goes on environmental levies, of which £45 goes directly towards funding CERT. Not only is what you’ve read thus far totally asinine, it gets even better. The Department of Energy and Climate Change admitted last year that the scheme was flawed and resulted in significant wastage, with no proof that the light bulbs were being used in people’s homes. Yes you read right, no proof they were even being used!!! Talk about stupidity!!!!! One thing the article doesn’t note is the total cost of this stupidity. Take £45 x 200 million and you get a grand total stupidity cost of only £9 Billion pissed down the drain. For those in the USA that’s the equivalent of $13.4 Billion USD. How much of a carbon footprint was made getting the raw materials for all these light bulbs? How much of a carbon footprint was made manufacturing all these light bulbs? How much of a carbon footprint was made shipping all these light bulbs? How much pollution was created by all the ones that got thrown out because they didn’t fit anything? See why I call it CO2 Insanity? It is amazing the gigantic waste of time, money and materials that goes on in the name of saving the Earth. Comments Off on Get Yer Free Dimbulbs, Only £45 Each!!! This is more of the insanity the site’s title refers to, only this is the colossal, beyond belief type of insanity. I have to laugh at this article from Telegraph.co.uk. The author matter-of-factly writes about the monumental quantities of various kinds of power generating equipment that will have to be installed and completely ignores the staggering costs of it all. Every car on the road will need to be electric and there will be solar panels on every home, 10,000 wind turbines onshore and 40 new nuclear power stations if the Government is to stand a chance of meeting strict climate change targets, engineers have warned. The report assumed that the maximum level of renewable electricity will be installed including 9,600 wind turbines on land and a further 10,000 turbines at sea. The Severn Barrage will have to go ahead as will as 1,000 miles of wave machines and further installations for tidal power. Most of the country’s 25 milliion households will have to install solar papenls and scrap boilers in favour of heat pumps that take heat of of the air or the ground. The average cost of a nuclear power plant at $10 billion. They want 40 of them, so that’s about $400 billion. There are about 17 million cars on the road in the UK. NADA puts the average cost of a car in the US at $28,400. (Couldn’t find one for the UK). Using this figure, replacing all 17 million cars at $28,400 that totals $482.8 billion. Based on electric car prices (Chevy Volt for example), I’d say that’s a conservative figure. A good solar panel system for a house will run about $20,000. Take the 25 million households in the UK and that totals up to another $500 billion. Replacing boilers with heat pumps seems to be going for about $5,000 per house x 25 million = $1.25 billion. One commercial scale wind turbine runs about $3.5 million installed. Take that times 20,000 and you get $70 billion. $650,000 per generator to manufacture. Per the article they’ll need 1,000 miles of wave machines. I have no clue how many per mile will be installed (can’t find anyting online), but if we just put one per mile that would be 1,000 of them. Let’s say $1 million per installed and you have another $1 billion. (Sounds cheap to me but since I can’t find any more info we’ll go with that). Now for the low power coal or nuclear power plants, lets take coal. A coal plant is about $1.83 billion for a regular one. Add carbon capture to it and I’ll take a wild guess and say $3 billion. They will need 40 of those, so that is another $120 billion. This totals to a staggering $1.58 trillion, rounded off. I don’t think that will be all that’s involved, either. If you switch to all electric cars, you have to add in the cost of putting plugs in for car charging stations all over the UK. You will also have the cost of removing or altering 9,271 gas stations, and the cost of scrapping 17 million cars. They will have to be scrapped because they’ll basically be useless unless someone comes out with a nifty kit to convert from petrol to electric. The main goal of this is to reduce carbon, right? Now can you imagine the carbon footprint of converting 25 million houses to solar, switching 25 million boilers t0 heat pumps, building 17 million electric cars, building 40 nuclear power plants, building 40 coal power plants, building and installing charging stations all over the country, scrapping 17 million cars, scrapping 9,271 gas stations and building and installing 1,000 or so wave generated power plants? Can you imagine the eyesore of 20,000 wind turbines and 1,000 wave generators? Can you imagine the noise created by 20,000 wind turbines? Not to mention that with all those wind machines I wonder how much longer birds would be left in Britain, as they’d all be chopped to pieces. Is this really going to lower the carbon footprint? I certainly have to wonder if after all is said and done, and you take all this into consideration, that it might not actually increase the carbon footprint? Let’s go global now. Say the UK is about an average size country. (I have no clue and I’m not about to figure it out if you want to, be my guest), and that $1.58 trillion per country would be about average. Depending upon the resource, there are about 195 independent countries in the world today. Now we have UK sized ones, huge ones like the United States, China, Russia, and small ones like Monaco, Switzerland, etc. Take that $1.58 trillion, multiply it by 195 and that my friends, totals to about $308 trillion dollars! Based on what I see, if a government gets involved (and I don’t care what one, they’re all alike on spending) you could probably be realistic by at least doubling that to $616 trillion dollars. An insane sum indeed. Is there that much money in the world?